When you get to the point where you are making curve cuts and scrolls, you will want to purchase a jigsaw – Shari’s favorite saw! The Jigsaw, the sewing machine saw! 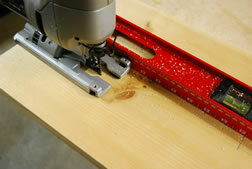 Other than a circular saw, the jig saw is one of the power tools that I keep in close arms reach in my home shop. 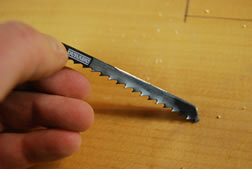 This is a finesse tool; I use it for making decorative cuts in a variety of different projects. It can also be used for cutting out a hole for a sink in a counter top, for making holes for electrical outlets, and cutting holes for pipes in cabinets. 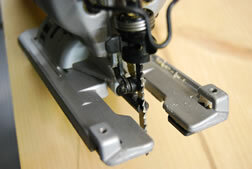 The short, sewing machine action of the blade enables a jigsaw to cut straight lines and cut into tight corners. It will also do those big sweeping curves that a circular can’t do. It’s not a tool you will use everyday, but is probably the second tool you will or did add to your workshop after purchasing a drill. It is one of those tools that takes a novice just a short time to master, jigsaws are not that great for cutting fast long straight lines, use a circular saw for that, but for cutting curves and complex shapes, this is the tool. Jigsaws come in a couple of price ranges; simple models which are fine for occasional use run under 60 dollars. 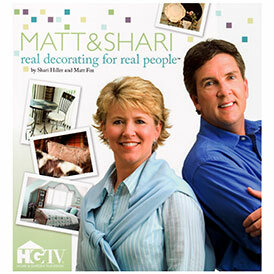 Professional models can start at 100 dollars. The features that are on each model will determine their cost and from that you can determine the amount of money you are willing to spend. Some of the features to look for are variable speed control, which allows you to customize each cut and to slow the blade down when you are at a tricky point of the cut. Single speed jigsaws operate at a high speed the whole time, and are primarily woodworking saws, with a variable speed jigsaw the stroke rate is controlled by the amount of pressure applied to the operating switch or trigger. Generally top speed is reserved for cutting wood, the midrange for plastics or soft metals, such as aluminum and the low speeds for steel and ceramic tiles. A basic jigsaw moves the blade straight up or down. Saws with orbital action cut faster by advancing the blade into the work on the upstroke, the blade swings slightly forward helping the saw cut more aggressively, this action also helps minimize the wear on the saw teeth and clears the kerf or cut at the same time. Reserve a higher orbiting rate for soft woods and stopping the action completely for steel and sheet materials. The average jigsaw will cut softwoods and hardwoods up to 2 inches thick, it will also cut nonferrous metals up to ½ thick and steel up to 1/8 in thick. 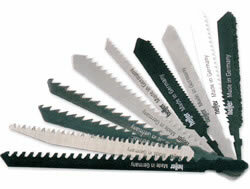 All jigsaws are designed for easy blade replacement, mainly because you will replace a blade instead of sharpening it. 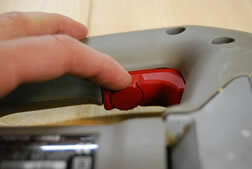 So you want to make sure that you replace a blade as soon as it becomes dull and of coarse if it breaks. Different blades are available for cutting a variety of materials and woodworking blades are made with specific tooth configurations for a finer, faster and smoother cut. As a rough guide the smaller the teeth the finer the cut, and as tooth size increases, so does the speed at which the blade will cut. 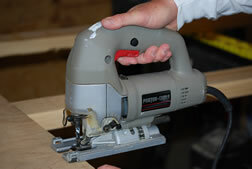 For quick cutting use a coarser blade, but the coarser the blade the more sanding later. 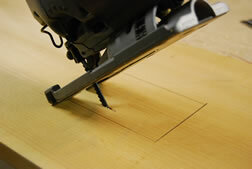 Jigsaws blades tend to bend when cutting curves in thicker boards, leaving a beveled edge rather than a square one. 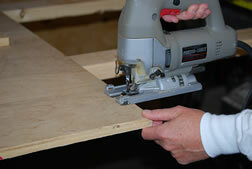 To keep the cut square, use a sharp blade and avoid forcing the saw through the cut. Changing a blade depends on the type of model you have, some models have quick release blades, which save the time of using an allen wrench or screwdriver to replace the blade. Follow the manufacturer’s instructions and make sure the roller guide is supporting the blade from behind, and of course always unplug the saw when changing a blade. When starting to make cuts with a jigsaw, the reciprocal action of the tool will set up a vibration in the work unless the piece is clamped to a bench or held down firmly on sawhorses. 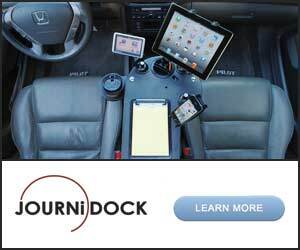 This is especially true of sheets of thin hardboard or plywood. 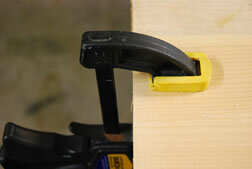 Which should be supported on both sides of the line of cut by 2 x 4‘s resting on sawhorses. To make a freehand cut, rest the front of the shoe on the work, with the blade just clear of the edge and aligned with the line of the cut. Switch on the saw and advance the blade into the wood just on the waste side of the line. Push the saw through the work at a steady rate, but do not force it. Slow down for the last ½ inch or so supporting the off cut as it is removed. Making very tight curve cuts should be cut using a scrolling blade, but sweeping curves can be cut freehand with any blade. 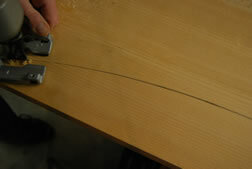 If a blade begins to strain on a tight bend, make straight cuts in the waste up to the line of cut first. This causes the waste to drop out in sections as the cut proceeds, giving greater clearance for the blade. 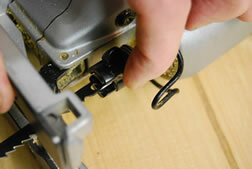 Making a plunge cut with a jigsaw eliminates the need to drill a starter hole. 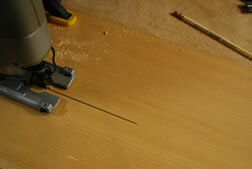 Tip the saw onto the curved front edge of the shoe or base, with the blade clear of the work. Switch on the saw and pivot it on the shoe, gradually lower the blade into the wood until the tool is upright and the shoe is flat on the work. Always make a plunge cut in the waste, not to close to the line of cut. Just a few more safety tips to make you jig saw experience more enjoyable and safe, check that the intended path of the blade is clear below the work, that means looking under the piece, I have ruined many a work bench this way. Make sure the cord trails behind the tool, never in front of the blade, duh! Use sharp blades only, dull blades will cause you to force the cut. Never curl your fingers around the work piece near the line of the cut. Relieve the pressure on the saw as you are about to finish a cut, to avoid sudden acceleration as the blade leaves the cut or kerf. Switch off the saw and wait for the blade to stop before setting the saw down. And of course always wear you safety glasses. This is the type of tool that takes a little practice, you may be interested in a couple of our wood working projects that call for a jigsaw, one of my favorite is the garden angel. 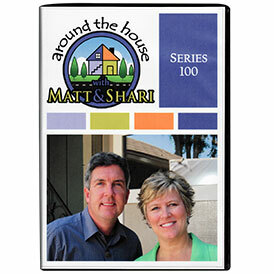 Look for it in the shop project section under outdoor projects. For those of you just starting to build up your tool box, this is a great tool to add and really doesn’t cost a lot of money, I just saw one at a local hardware store for under 30 bucks, not a lot of bells and whistle, but do you really need a laser guided, rocket powered jig saw…I don’t think so. This was incredibly helpful thanks so much!